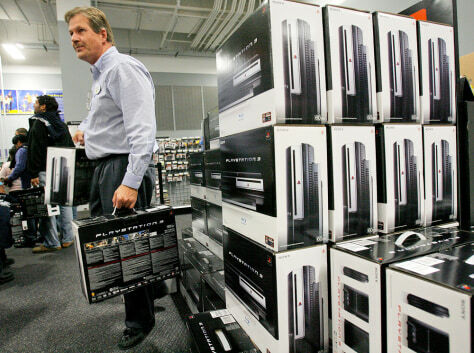 Best Buy manager Pat McGann, left, carries boxes of Sony PlayStation 3 game consoles at a Best Buy store in Los Angeles. Die-hard gamers and entrepreneurs shelled out $500 or more for Sony's PlayStation 3 as the console made its U.S. debut. Many had camped out for days without knowing if they'd be going home empty-handed.